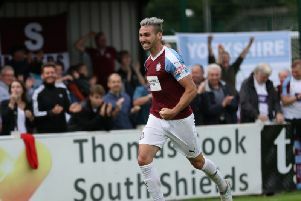 South Shields were knocked off top spot in the Evo-Stik Premier Division as they fell to a 3-0 defeat at Warrington Town on Saturday. Warrington replaced the Mariners at the summit as they inflicted a third league defeat of the season on their opponents, who were missing the likes of Gavin Cogdon, David Foley, Carl Finnigan and Josh Gillies through injury. Shields lined up with a 3-5-2 formation and started well, but were unable to create a clear-cut opportunity. They fell behind eight minutes before half-time and conceded twice more towards the end as Warrington claimed the three points. It was a match of few real chances, although Shields goalkeeper Liam Connell was called into action in the first minute when he comfortably saved from Jack Mackreth. The Mariners would have been the team more satisfied with their start as they kept the ball well, but they failed to test Anthony McMillan in the Warrington goal. 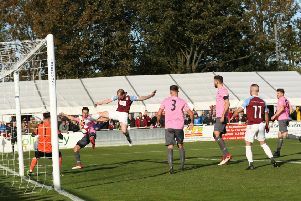 Their best opportunity to do so came in the 19th minute when Dan Wright was fouled 25 yards from goal, but Robert Briggs lifted the resulting free-kick over the bar. Warrington were unbeaten in 10 games heading into the match and had the league’s best defensive record, having conceded just three times in eight games. They went close to taking the lead in the 21st minute when Connell was forced out of his area to head a ball clear, but it fell to Bohan Dixon, who skewed his effort wide from long range. Shields breathed another sigh of relief just before the half-hour mark when Robert Evans whistled a shot not far over from 20 yards for the hosts. The Mariners’ best chance of the first half came when a Briggs corner from the right was headed out as far as Gary Brown, who dragged an effort from the edge of the box which took a deflection before going wide. Warrington broke the deadlock eight minutes before half-time when Dixon was played in on the inside-right channel and he showed good strength before hammering the ball into the bottom corner. Shields introduced Dan Lowther at half-time and tried to put their hosts under pressure, to no avail. Chances were hard to come by at both ends, although Dillon Morse saved the Mariners when he headed the ball behind under pressure in the 66th minute. Shields threatened an equaliser after some enterprising play on the left involving Blair Adams and he was presented with an opportunity to shoot in the penalty area, but he skewed an effort wide with his wrong foot. Warrington notched the killer second goal 10 minutes before the end when Shields gave the ball away in a dangerous area and substitute Jake Kirby rifled it past Connell from outside the box. Another substitute, Josh Amis, went close to making it three almost immediately after, but his piledriver from a tight angle just cleared the bar. Amis did prove to have the final say, though, as the ball fell to him in the box in the fourth minute of stoppage time and he prodded it home. It capped a disappointing afternoon for the Mariners, who will hope to bounce back on Tuesday when they travel to Buxton. SOUTH SHIELDS: Connell, Baxter, Brown (Lough 76), Shaw (c), Morse, Turnbull, Wright (Harmison 63), Mouanda (Lowther 46), Mason, Briggs, Adams. Subs not used: Lister, Hunter.